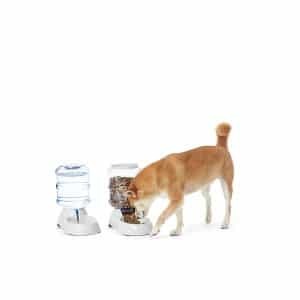 If you’re not always around to look after your pets and feed them at regular hours, buying the best cheap automatic dog feeder should be your number one priority. You don’t even have to spend time searching for such an item yourself, as we got you covered. After going through plenty of online reviews and reading the opinions of various customers, Dr. Fox concluded that a reliable item would be the Petmate Pet Cafe. It relies on gravity to dispense dry food as your dog is emptying the bowl, ensuring he or she always gets the perfect amount of food. The item is easy to clean and is ideal for a house full of pets. If you can’t find this product for sale right away, perhaps you should consider the AmazonBasics Self-Dispensing Gravity as a worthy alternative. Lightweight and easy to use, this product comes with a container available in four sizes. 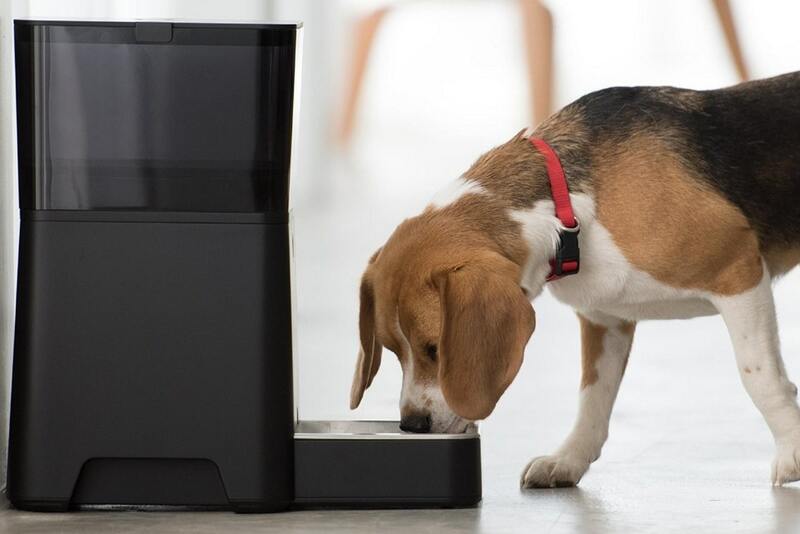 Based on the gravity technology, it will dispense food as your dog is emptying its bowl, helping prolong the time between refills. The wide mouth bottle is easy to refill and clean, preventing spilling and food waste. It doesn’t require batteries or plugging into a power socket. You cannot adjust the amount of food your pet receives per meal. It is made of plastic and can be damaged or moved easily by large dogs. It is mainly designed for those who cannot invest in a dispenser with more functions and features yet. It is great for dogs that don’t have eating problems. This 2-in-1 machine is completed with a waterer and a feeder, suitable for when you need to get out of town quickly. 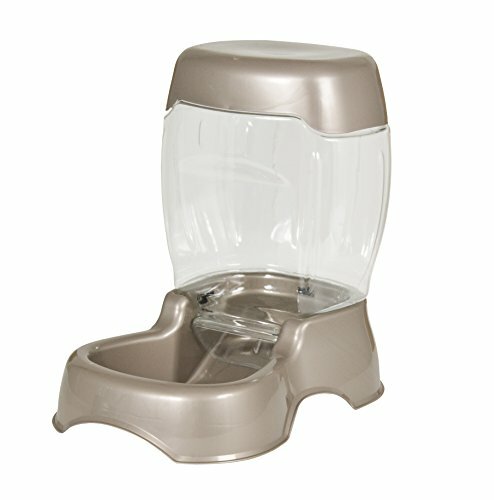 It dispenses a good amount of fresh water and food so your dog will benefit from the perfect diet. It features two sturdy cut-out handles that ensure easy transportation, while the non-skid rubber feet allow you to place the feeder on any type of surface without slipping. You cannot preset the amount of food your dog eats per meal, which is kind of risky if your pet is under a strict diet and needs to lose a few pounds. Affordable, easy to use and convenient, the product is suitable for those who live a busy life and don’t always find the time to feed their pets themselves. It is designed to hold up to 5 pounds of food or 24 cups, enough to feed a medium-sized pet for the entire weekend. It is lightweight, efficient, and easy to use, without requiring batteries or power outlets. It is made of high-quality materials, FDA-approved and BPA-free, so it won’t cause allergic reactions or health problems to your pet. It can be easily refilled. Some customers say that the container over-fills the bowl with food, causing food waste. Due to its uncommon shape, it requires a lot of space to deposit. Although made of plastic, this feeder is sturdier than other products within the same price range. It makes a great addition to travelers and pet owners. Finding the right feeder for your pet’s needs could take you a lot of time, so why not allow us to handle things for you? We made a list of five of the most popular and sought-after products you should take into account. Showcased below you can find everything you need to know about each of them. Very easy to use and affordable, the new Petmate Pet Cafe could prove the right solution if you don’t want to spend every second watching your dog’s diet. The container is available in various sizes, ranging from 3 pounds to 12 pounds, depending on how many pets you look after or how big your dog is. The product’s primary function is to ensure your pet has plenty of dry food to go through the day. It features a wide mouth bottle which you can easily remove from the base and wash. We suggest you hand wash all the detachable parts of this product instead of putting them in the dishwasher along with the rest of the dishes and cutlery. The storage feeder features an easy-snap lid that you can access to refill the container whenever it’s empty. Therefore, it only takes a few moments for your pet to have access to the right amount of food. The item is sturdy and made of high-quality materials for a long-lasting existence. 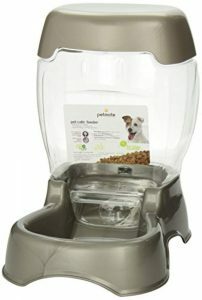 Moreover, it is spill-free thanks to the easy-grab cutouts that allow you to lift the food dispenser without spilling. It doesn’t come with complicated features or buttons, so it’s perfect for beginners. The dispenser comes in various sizes so you can pick the right one for you. The 6-pound option allows you to provide up to four meals a day for a few days for a large dog, which is perfect if you have plans for the weekend and don’t want to bother your friends or neighbors to come over and babysit your pet. The snap lid ensures easy refilling in just a few moments, so your pet never runs out of food. We also like that this product is available in various pearlescent colors to easily match any decor and furniture in your house. It is made of high-quality BPA-free plastic that is safe to use and won’t cause allergic reactions. It relies on the gravity technology that isn’t too accurate. You can’t preset the amount of food requires for each meal, which could lead to overweight or obesity problems in time. If your puppy or dog has bad chewing habits, you might have to avoid this item as it is made of plastic. Affordable and reliable, this item is suitable when you have a busy life but don’t want to neglect your pets. The 2-in-1 product comes with a waterer with a 1-gallon capacity and a feeder with a total capacity of 6 pounds. Both parts are made of PET and lightweight. In addition, thanks to the side cut-out handles, the device is easy to lift and transport wherever you want. It even comes with rubber feet so you can place it on any type of surface, including marble, tiles or laminate floors, without slipping and causing a mess all over the place. The extra-wide mouth allows you to easily refill the containers with food and water and clean them. For this operation, we suggest hand washing it only. Use warm soapy water and thoroughly cleanse and rinse. Allow it to thoroughly dry or wipe it with a soft cloth before using it again. It doesn’t come with any sophisticated functions or buttons and works on the simple principle of gravitation. Therefore, you don’t have to plug it in or change its batteries to make sure your pet always has a reliable source of fresh water and food. The non-skid rubber feet are suitable for placing the feeder anywhere you want in or outside the house. Therefore, it won’t slide or scooch across the floor, be it tile, marble or hardwood. Both the feeder and the waterer are easy to refill in just a matter of seconds. All you have to do is unscrew the top lead and pour the amount of food or water you want. It’s made of plastic and is easy to clean using warm water and mild soaps or detergents. Since the containers are large, we suggest hand washing it only. The side cut-out handles make this machine easy to transport and carry, even when it’s full. The product is not that sturdy and reliable, so it can still be moved or chewed by bigger and more powerful dogs. It’s not the ideal feeder if you need to strictly watch over your pet’s diet as it doesn’t allow you to control the amount of food it receives per portion and meal. Affordable and reliable, this item doesn’t require complicated setup instructions or the use of electricity or batteries to operate. 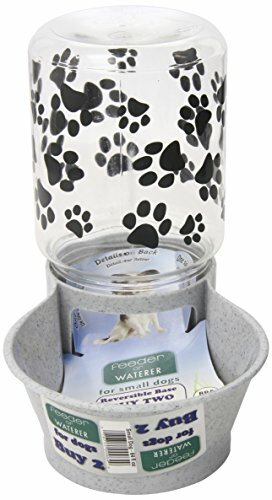 Therefore, you can place it anywhere you want inside or outside your house and teach your pets to serve their own food whenever they need. 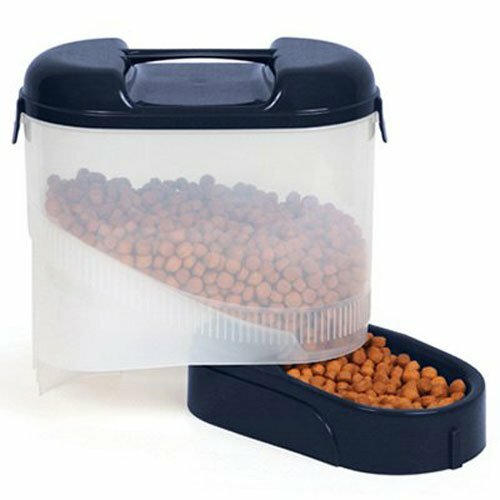 The handy storage solution is suitable for those who travel a lot and cannot always feed their pets themselves. It comes with a five-pound food container that can provide up to 24 cups of food, enough to last one-three days, depending on your pet’s size, age, weight, and dietary needs. Thanks to the snap lid and rotating base, the item is easy to use, even by those who don’t have experience with dog feeders. The product is made of high-quality plastic, FDA-approved, and BPA-free, meaning it is safe to be used by all pets. It doesn’t contain any chemicals or dangerous substances that can cause allergic reactions or health problems to your dog or cat. Just like other similar food containers, this one is entitled to dry food only. For a complete and balanced diet, we suggest you combine dry kibbles with the most delicious dog treats for puppies and some organic and low-calorie dog foods with probiotics. It is easy to use and hustle-free as it doesn’t require complicated functions or the use of energy or batteries. 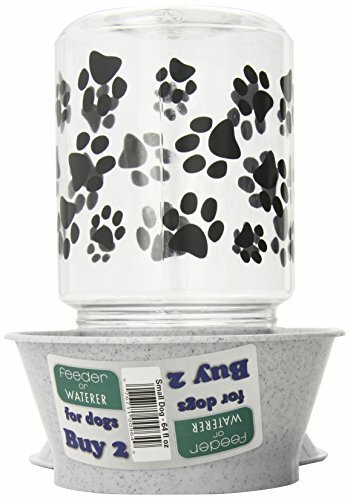 Therefore, you can place this item anywhere inside or outside the house to feed your pet at regular hours. The large five-pound container can provide up to 24 cups of dry dog food, enough for a medium-sized dog to last the entire weekend. It is made of BPA-free and FDA-approved plastic that doesn’t contain any harsh chemicals or dangerous substances that might cause allergic reactions. It features a large snap-lid that allows you to refill the container whenever it’s empty easily. Some customers claimed the product causes quite a mess as the kibbles spill and scatter across the floor. It’s not the ideal solution for dogs that need to follow a strict dietary plan as it doesn’t allow you to measure and control the food portions. Designed to meet the needs of people with a house full of pets, the large 10-pound container provides enough food for all your dogs or puppies when you are away. It relies on the gravity technology that pushes the food from the container to the bowl as the bowl empties. The transparent container is made of sturdy plastic and allows you to see when it requires a refill easily. Besides, refilling the feeder is easy and stress-free due to the large lid on top. It prevents spilling and food waste. The removable lid ensures easy cleaning. For thorough cleaning, we suggest using warm water, and mild soaps and detergents. The product is large enough so it may not fit in your dishwasher, and this is why we suggest you wash it by hand. As with many other similar feeders, the main drawback of this one is that you cannot preset the right amount of food that is dispensed for each meal. Therefore, there is a slight risk of your dog eating more food than it should, which could lead to further stomach problems and overweight or obesity. In order to prevent that, we suggest switching to superior quality dog food for sensitive stomachs or replacing some of the dry food with wet food or home-cooked meals. The large size of the container can hold up to 10 pounds of dry dog food, which makes the feeder perfect for households with multiple dogs or giant dog breeds. It is made of sturdy and reliable plastic that your pet cannot easily chew, bend, move or destroy. Thus, when the item is full of food, it would be hard to be moved from one place to another by your dog, which would otherwise cause food waste and messy floors. The large removable lid ensures easy cleaning and refilling in just a few minutes. It doesn’t require the use of energy or batteries to function, which allows you to place the product anywhere in or outside the house and use it in all weather conditions. If your dog is under a strict diet and should be fed limited amounts of food daily, this item may not be the best choice as it doesn’t help you preset exact portions of food. Therefore, there is a risk of overeating, as with most other products that simply rely on gravitation. If you’re looking for a compact and easy solution to feed your dog a delicious meal while you’re out of town or staying up late at work, this new item from Lixit could prove a reliable option. The colorful paw-print design is cheerful and will bring joy to every house, no matter where you decide to place it. And, thanks to its reduced dimensions, it can be stored and placed in narrow places too as it won’t occupy too much space. The 2-in-1 product features a reversible base that can be used both for water and food, based on your dog’s needs. The bowl is tall enough to provide enough fresh water or food for a couple of days, depending on the size, breed, age, and weight of your pet. The container can hold up to 64 fluid ounces of water and two pounds of food. 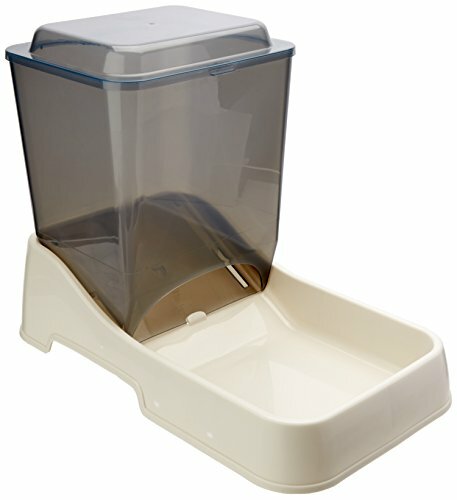 The wide mouth container ensures that the item is easy to refill and clean using warm water and mild detergents or soaps. The manufacturer suggests purchasing two products at the same time and using one for water and the other one for food. The container is made of BPA-free plastic and is safe to be used by all animals, without causing health problems or allergic reactions. The item is small, lightweight, and compact, which makes it easy to transport and store anywhere you want, including in narrow cabinets. You can even take it with you when traveling as it won’t occupy too much space in your luggage. It is made of BPA-free and high-quality plastic, ensuring a long-lasting life. It can be used both for water and food, offering enough provisions to last a couple of days. It is convenient to use and doesn’t require batteries or plugging it in. Some customers said the container must be empty before refilling it because, otherwise, it will spill the food everywhere. Others said the kibbles must be really small to fit through the tube so you might have trouble if you plan on feeding a larger dog. We suggest you keep this one as a water tank and find a bigger dispenser for food. 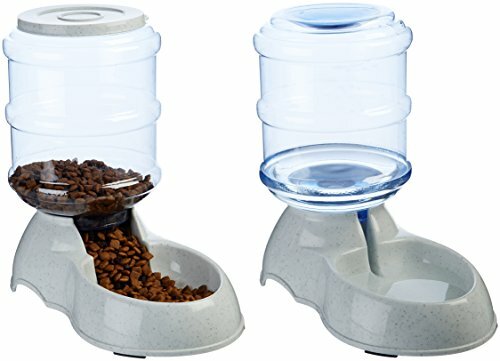 Finding a good cheap automatic dog feeder could prove a difficult task considering the variety of options available on the market. However, with the right insight and focusing on a few key features, you’ll easily purchase the most suitable product for your pet. If you plan on finding the right food dispenser, you need to check its size first. A large tank can provide enough food to last for a couple of days, depending on the size, weight, and dietary needs of your pet. On the contrary, small-sized containers are better for traveling, but they can only secure enough food to last you through the day. If you live a hectic life and you’re never sure when you’re going to get home, it would be smart to invest in an item with a storage capacity of at least 5-6 pounds. Also, the size of the bowl is important, especially if you want to look after your dog’s diet. Make sure you opt for machines with smaller bowls that can only serve a few cups of food at a time. This will teach your pet to refrain from overeating and, thus, gaining more weight. Dry food or moist food? Although kibbles or dry food are the most convenient for feeding your dog, they are not everything your pet needs for a healthy and strong body. Therefore, you could purchase a food dispenser that also allows you to introduce semi-moist foods such as food cans for more diversity. Don’t forget to also add fresh fruits and veggies on a regular basis. Adding one teaspoon of coconut oil for dogs in your pet’s food once-twice a week will not only change the taste of the food into something delicious but will also help your pet enjoy a shiny and luscious coat. If you’re still not sure which product could benefit your pet the most, why not check some online cheap automatic dog feeder reviews? Go through the opinions of other customers and make sure you purchase an item that meets the dietary requirements of your dog. For a balanced and complete diet, we suggest combining dry food with home cooked meals, snacks, treats, and perhaps some organic dental sticks for dogs of all ages to promote healthy and strong teeth as well. Since we are mostly referring to feeders that use the gravitational technology, the quality of the materials is crucial. The majority of the feeders are made of plastic, so make sure you opt for those that are BPA-free and antibacterial. These will undoubtedly reduce the risk of allergies or poisoning due to chemical compounds. The plastic should be sturdy too, especially if you have dogs with bad chewing habits. Otherwise, you might have to replace the feeder sooner than you would want to. We also suggest you opt for feeders with rubber feet that won’t slide or slip when placed directly on the floor, be it tile, marble or hardwood. As we previously mentioned, dry food should not represent 100% of your dog’s daily diet. It would be ideal to provide 60% dry food and 40% wet food in the form of canned food, home-cooked food or organic treats and supplements. Based on your dog’s age and breed, make sure you calculate the right amount of daily proteins and carbs required. For instance, puppies need high-calorie foods with lots of proteins and carbs to boost their energy levels, while older dogs will require high-quality and low-calorie senior dog food, rich in fibers and natural antioxidants. Lastly, don’t forget that different breeds require different diets. Some dog species like huskies and French bulldogs are prone to obesity so you should consider integrating healthy and specific dog food for huskies to keep them healthy and active without gaining weight.